O’Keeffe, Stettheimer, Torr, Zorach: Women Modernists in New York at the Portland Museum of Art brings together the art of four American women artists who worked in New York City from about 1910 to 1935. The stated purpose of the exhibition is to examine the effects of gender on the careers, work, and reception of Georgia O’Keeffe (1887–1986), Florine Stettheimer (1871–1944), Helen Torr (1886–1967), and Marguerite Zorach (1887–1968) in parallel, while also arguing that femininity did not define their various approaches to modernism. These four artists are also analyzed within two specific, shared circumstances: women’s increasing political and social freedoms in the early-twentieth-century United States and the New York avant-garde art world. The exhibition and its accompanying catalogue give new context to the substantial existing scholarship on O’Keeffe and gender, and offer valuable insights into the less studied lives and artistic contributions of Stettheimer, Torr, and Zorach. In Portland, the exhibition includes fifty-nine of the sixty-five works that appeared at the first venue, the Norton Museum of Art. These are spread across four galleries: three large and airy spaces, and one small room dedicated to works on paper. Approaching the opening gallery from the main lobby of the museum, the first object a visitor sees is O’Keeffe’s Jack-in-Pulpit Abstraction–No. 5 (National Gallery of Art; 1930), isolated on a gray background. 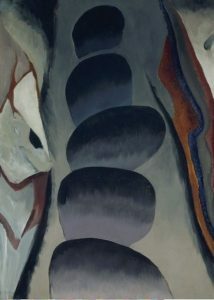 Widespread interest in O’Keeffe all but guarantees healthy attendance at any exhibition in which she is featured, and this exhibition’s title and layout clearly foreground her name and work. 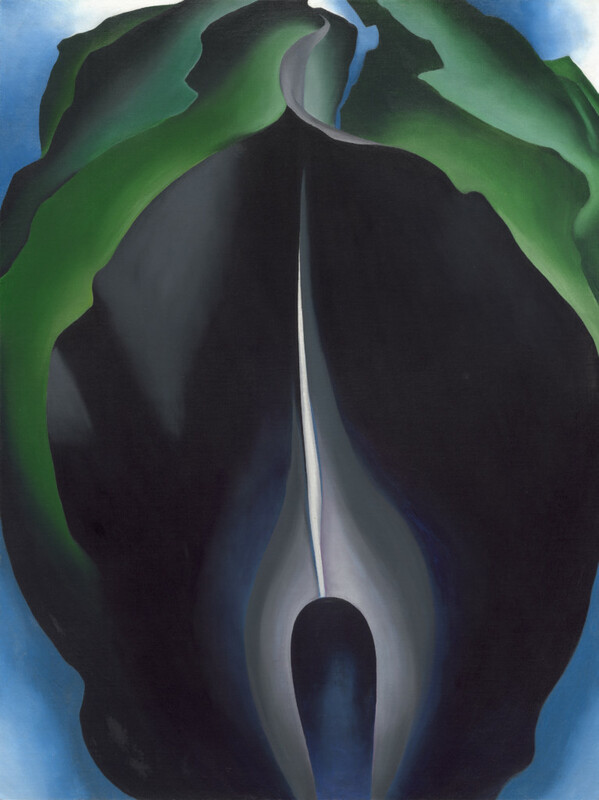 Placing this visually arresting O’Keeffe painting at the entry point immediately reassures the audience that they will see what they came for. In fact, the first gallery is dominated by six O’Keeffe paintings of flowers, including her large and impressive Jack-in-Pulpit series. These are accompanied by two small landscape paintings by Zorach and one small still life of leaves by Torr. In the opening gallery and throughout the exhibition, works are arranged in sometimes uneasy groupings based on loose iconographical and formal affinities rather than by artist. These are tough pieces to exhibit together; O’Keeffe’s smooth simplicity, Stettheimer’s heaped, candy-colored masses of paint, and Zorach’s strong, quasi-fauvist compositions often seem to compete with one another and overpower Torr’s quieter style. As is standard museum practice, the curators appear at pains to create the most pleasing juxtapositions and harmonious galleries possible. In the first room, for example, the placement of Zorach’s Bathers (Norton Museum of Art; c. 1913–14) with O’Keeffe’s Jack-in-Pulpits takes advantage of the works’ shared green and purple palettes, natural subject matter, and central vertical forms to ease the pairing of these very different artists. One wonders what might have happened had the curators explored, instead of minimized, the dissonance of these four unique voices. While O’Keeffe dominates the beginning of the show, the remaining three artists come into focus as the exhibition progresses. Information about each appears on one modest biographical panel adjacent to a concentration of her work, and individual labels for objects by that artist are color coded to match. The biographical panels describe their respective positions: O’Keeffe was married to the influential photographer and dealer Alfred Stieglitz, Torr to Stieglitz Circle member Arthur Dove, and Zorach to the increasingly better-known artist William Zorach. Stettheimer never married, but she and two of her sisters hosted an exclusive salon regularly attended by modernists including Marcel Duchamp, Gaston Lachaise, and the Zorachs. The panels also endeavor to explain the ways in which each woman was marginalized by the relentless interpretation of her work through the lens of gender, although this proves challenging in the limited space available. A powerful grouping of four of Stettheimer’s most well-known paintings, including Spring Sale at Bendel’s (Philadelphia Museum of Art; 1921), hangs to the right of the entrance in a separate corner of the first gallery. 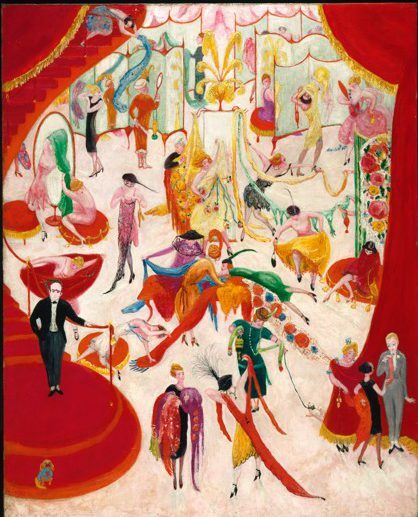 Unlike O’Keeffe, Torr, and Zorach, Stettheimer consistently engaged with caricature, satire, and commercial culture. For example, Spring Sale at Bendel’s employs a hybrid, illustrative yet modernist style to depict a cartoonish frenzy of bargain hunters invading a highly-exclusive New York department store. This isolated cluster of paintings highlights how different Stettheimer’s conceptual approach is from that of the other three artists, and how challenging it is to integrate her work into the intellectual framework of the show. Following a small, adjacent gallery of assorted works on paper, visitors enter the central space of the exhibition. Here, Torr and Zorach come into focus with a group of land- and seascapes in cool tones. Torr is perhaps the most difficult of these four artists with which to reckon. Until two striking, late-career self-portraits, her shifting style often bears a perplexing resemblance to that of her husband, Arthur Dove, and other contemporaries. 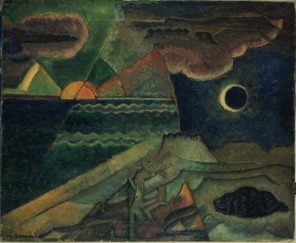 For example, despite distinctions drawn in the catalogue, Evening Sounds (Museum of Fine Arts, Boston; c. 1925–30) is closely related to Dove’s own experiments in representing sound. The gallery label text challenges the interpretation, advanced by Stieglitz among others, that this similarity means Torr’s work is derivative. It instead presents the argument that she and Dove together developed a single, original and distinctive style attributed only to him on gendered grounds. While her status as Dove’s wife clearly affected the reception of Torr’s work, this concept of a shared modernism developed in unison would require a more complex theorization than the exhibition or catalogue provides. This argument is also complicated by the fact that Torr’s work at times resembles that of other artists; her nearby Shell, Stone, Feather and Bark (private collection; 1931) bears a striking similarity to O’Keeffe’s precise still lifes in shallow, neutral spaces. In the long final gallery, visitors encounter works primarily grouped by genre, including still life and portraiture. Objects by O’Keeffe all but disappear and Zorach becomes a focus. This section includes little known but extraordinary works by her, in particular the 1916 paintings Justin Jason (Andrew Nelson Collection), which reveals her to be at the forefront of the flattened, geometric modernism of the period, and Provincetown, Sunrise and Moonset (Sheldon Museum of Art), which anticipates post-war attempts by Stieglitz Circle artists to blend abstraction and landscape. A group of Zorach’s rarely seen fabric pieces, created after 1915 in an effort to support her family financially, hang in an alcove off the final gallery. These often-overlooked examples of modernism in a conventionally feminine medium are usually relegated to museum storage because, like most textiles, they are easily damaged by extended exposure to light. Brought into view, however, Zorach’s Tree of Life Coverlet (Smithsonian American Art Museum; c. 1918), Pegasus/Hand Bag (Smithsonian American Art Museum; c. 1918), and other embroidered works allow visitors to glimpse the complexity of the gendered relationships between fine art, modern design, and home decoration at this time. The installation as a whole is expertly, if traditionally, curated. The cream-colored walls (with the occasional gray feature wall), absence of potentially-distracting didactic or interactive elements, short and conventional general-audience object labels, and wide expanses of wood-and-stone floor would be familiar to any exhibition-goer. Showing the work of these artists in this customary format assures that the exhibition is accessible to the widest possible audience, but at the same time it visually assimilates them into institutional art history instead of allowing them to disrupt established practice. The exhibition catalogue also sets out to prove that these artists, particularly the lesser-known three, deserve to be integrated in the modernist canon. It is organized into four monographic chapters, each of which painstakingly describes the life and work of a single artist. The book also contains a short introduction and conclusion that discuss the broader social context in which each woman operated, although without substantively examining the roles of race and class in shaping their positions in the art world. In the introduction, Ellen Roberts also outlines her methodological approach, describing the use of case studies in the book by Anne Wagner, Three Artists (Three Women): Modernism and the Art of Hesse, Krasner, and O’Keeffe, as her most important conceptual model. The structure of the project, however, also recalls an earlier goal of feminist scholarship to recover and reevaluate forgotten female artists. Portland is the second venue of the exhibition, and the practical consequences are clear. As loans expire and curators collaborate with local colleagues, later venues always present additional organizational challenges. For example, in Portland one might well ask, where is New York? Even as the exhibition title emphasizes this important shared environment, images of the city are scattered and the subject is not thoroughly addressed. The catalogue checklist provides an explanation: two of O’Keeffe’s most well-known skyscraper paintings, The Shelton with Sunspots, N.Y. (Art Institute of Chicago; 1926) and the catalogue cover image, City Night (Minneapolis Institute of Art; 1926), appeared only at the Norton. Securing O’Keeffe paintings for an exhibition is difficult, because museums may balk at removing a popular object from their walls. Loans like these often involve significant bargaining and even exchanges, and if institutions can be persuaded to participate, they may limit their involvement to the first venue. The disappointing absence of a coherent examination of New York in Portland testifies to the difficult, but often inevitable, concessions inherent in organizing this kind of exhibition. The more fundamental strategic compromises necessary to make a large, expensive traveling show viable are also evident in almost every aspect of the project. Major loan exhibitions are enormously expensive and are required to perform an increasingly difficult balancing act between scholarly excellence and popular appeal. Curators must convince museum administrators that their project will result in significant attendance, external funding and publicity. Capitalizing on O’Keeffe’s popularity by structuring the exhibition around individual biography, and grouping her with the comparatively obscure Stettheimer, Torr, and Zorach, Roberts has managed to assemble an extraordinary, if uneven, group of little-known works from around the country that might otherwise have languished in storage. O’Keeffe, Stettheimer, Torr, Zorach: Women Modernists in New York succeeds in broadening our understanding of the complexity and variety of art by women in this period, and makes a convincing case for the importance of examining gender in American modernism. At the same time, the fact that the show is structured around gender makes it all but impossible to achieve its second goal: freeing these artists from a marginalizing focus on their femininity that continues to dominate the interpretation of their work. This exhibition nonetheless makes a significant contribution to the field and reveals areas ripe for future scholarship.